Kuching, 16th November 2018: The 5-day inaugural Agriculture Familiarisation Trip (Agri-Fam) 2018 which took place between 21st-25th October 2018 was organised in conjunction with the International Conference on Agriculture and Agro-based Industry Sarawak (ICAAS) 2018. The trip orchestrated the meeting of likeminded minds; experts in their respective agricultural specialisations which included researchers, academicians and invited national and international media. Highlights include best practices in smart or precision farming, public-private sector partnership, farmers’ organisations and ‘agropreneurs’ in commercialising the agriculture sector. A key component of the Conference was the introduction of the very first ‘Sarawak Agrofest’- spanning over a total of nine days and featuring 210 booths offering a plethora of local products, ideas and innovations. The event which was open to public, had featured a special Sarawak Smart Farming Pavilion; its insightful display was the advent of the latest modern technology. The introduction of the inaugural Agri-Fam 2018 was a strong indicator of the committed partnership between Sarawak Convention Bureau (SCB) with the Ministry of Modernisation of Agriculture, Native Land and Regional Development Sarawak (MANRED) since the launch of SCB’s BESarawak Alliance (BESA)- the dedicated associate platform for government ministries and agencies to further Sarawak’s economic transformation, which was launched two months ago. 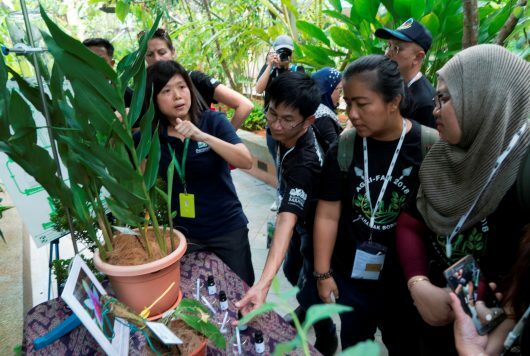 As the state recognizes the strength of a concerted approach towards the future of Business Events, the impact of this collaboration is manifold; with a highlight on Sarawak’s unique biodiversity evident through the site visits encapsulated within the programme of the Agri-Fam 2018. Among the series of visits included one to the Sarawak Biodiversity Centre (SBC); a first of its kind in Malaysia to enact a biodiversity law in line with the Convention on Biological Diversity and the Nagoya Protocol (Access and Benefit Sharing). Notably, with its unique ‘Traditional Knowledge Documentation’ Programme, SBC has built an impressive inventory of biodiversity and a ‘Library of Natural Products’ with over 6,000 species that have been identified. In addition, Agri-Fam 2018 participants caught a glimpse of a sustainably-rooted corporate initiative as showcased by Hornbill Agriculture whose hope is to create the awareness of “Food Safety while increasing its productivity”. Its practices include the utilization of plant-based compost derived from organic waste that has been cultivated by probiotics. Spanning over 135 acres to date as it continues to expand its production, the company currently focuses on sweetcorn, papayas and ‘terung dayak’ production. Immediately after, a demonstration by social enterprise, WormingUp; a waste management consultancy that utilizes its own technology to ultimately reduce food waste efficiently took place. WormingUp is responsible for Hornbill Agriculture’s waste management and Jeff Wee, its founder, gave an insight to the processes of ‘worm composting’ and ‘enzyme composting’- both crucial to the enterprise’s operations. Weaved between site inspections to Kuching’s prominent business hotels and convention centres, was a visit to a stingless bee (kelulut) farm in Sampadi, Lundu and to a processing plant in Demak Laut afterwards. 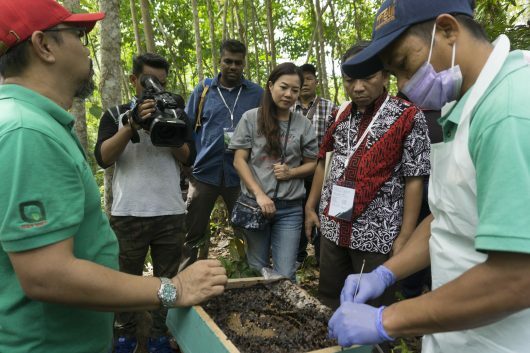 Sarawak being the largest producer of kelulut honey in Malaysia with over 200 stingless bee farmers in the State, opened its doors to the international participants who saw potential of the “new honey” as commercialization continues to overshadow what was once a cottage industry. SCB’s commitment to elevate the status of Sarawak in terms of Business Events continue to rise as this trip; a first of its kind, that paves the way for many more alike opportunities and equally applicable to other sectors. Working in tandem with the State government’s vision, the knowledge exchange and potential collaborative efforts during the Agri-Fam trip had already bore fruit as it drew to a close. SCB’s General Manager of Government and Industry Relations- Chew Chang Guan, is optimistic of what the future engagements would entail. “SCB’s strength in bringing in various international conferences translates to the influx of experts coming to our shores. We must capitalize on how this can help us to grow. The State’s focus is on agriculture, more importantly how it sits in this digital era that we are traversing into. Therefore, we must combine our skills and leverage on our global partnerships to watch Sarawak grow from strength to strength. In return, we are also very pleased that our experts who have graced us with their presence for the Agri-Fam 2018 trip and to showcase our own specialties and open the door to more agricultural alliances” he concluded.